- Enjoy up to 6 months of clean, great-tasting drinking water straight from your tap. 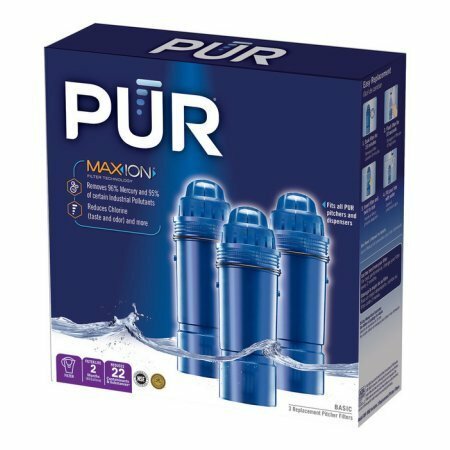 - This is a 3 Pack of PUR Pitcher Water Filter Replacement Filters. Warning Text: The contaminants or other substances removed or reduced by this water filter are not necessarily in all users' water. Do not use with water that is microbiologically unsafe or of unknown quality, without adequate disinfection before or after the system. Individuals requiring water of certain microbiological purity should consult their physician. Instructions: Easy Replacement: 1. Soak filter for 15 minutes. 2. Flush filter for 10 seconds. 3. Insert filter and twist to lock. 4. Fill pour tray with water. See owner's manual for details. Get the best from your filter. For best performance, change your filter every 2 months. Enjoy up to 6 months of clean, great-tasting drinking water straight from your tap.